Steamed minced pork is a much loved dish where I come from. This is something I made weeks ago but haven't had the time to blog about because I was gallivanting in and out of town. The busy bee gathers more honey - equating honey with sweet life experiences. I went to Kajang for a holiday, and then zoomed to Penang the following week for Cheng Beng (Tomb-Sweeping Day). In between, a flurry of visits from relatives kept me occupied with touristy activities. Now that things have settled down, I'm back to blogging again. Here's how I prepared this simple dish. 1) Mix minced pork with onion, spring onion, cooking wine, salt and pepper. 2) Spread pork mixture onto steaming plate. Drizzle water all around. 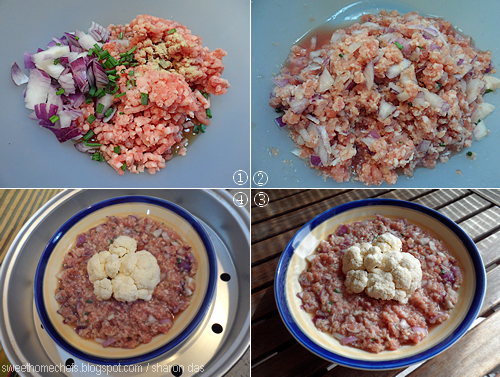 3) Arrange cauliflower florets in the center. Sprinkle a little salt over. 4) Steam for about 10 to 15 minutes in a pre-heated cooker (I use an electrical cooker). *Note: I sliced the cauliflower stems thinner (or away), so that it takes a shorter time to cook. 1) Gather ingredients into a bowl. 2) Mix ingredients together. 3) Place pork mixture onto steaming plate. 4) Steam! Taste-wise, a pleasant deep (but not strong) savoury flavour due to the addition of wine. 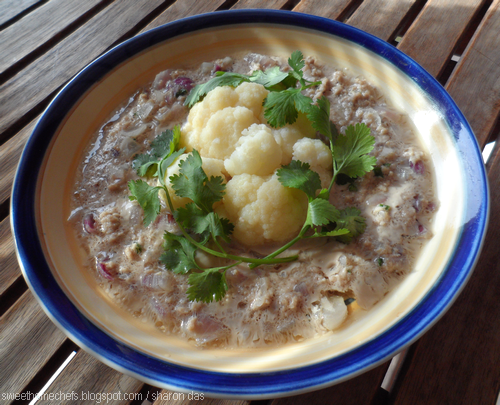 Cauliflower has a natural sweetness that compliments the overall dish. Best eaten with rice! Love the presentation, dear! 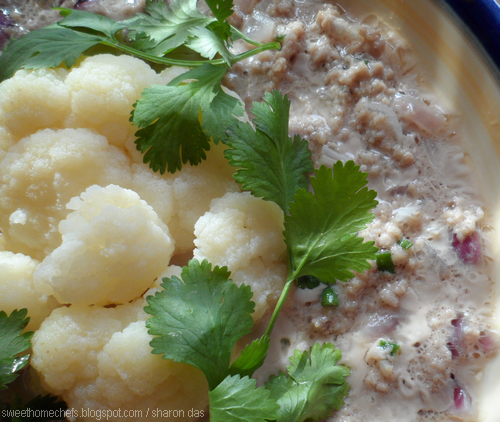 I've never tried minced pork steamed with cauliflowers. Yum! Thank you, Shirley. Thought I'd add a little veg into this meaty mix! A homey and very moreish dish! You're welcome, Juliana. Hope you're having a great week too!